At RAPID 2016, North America’s largest professional 3D printing tradeshow, Additive Industries presents it first truly industrial 3D metal printing system, MetalFAB1. This is the first time across the Atlantic and the official launch for the US market. The MetalFAB1 system offers substantially improved performance over typical midrange systems. The industrial grade additive manufacturing machine and integrated Additive World software platform offers a tenfold reproducibility, productivity and flexibility. 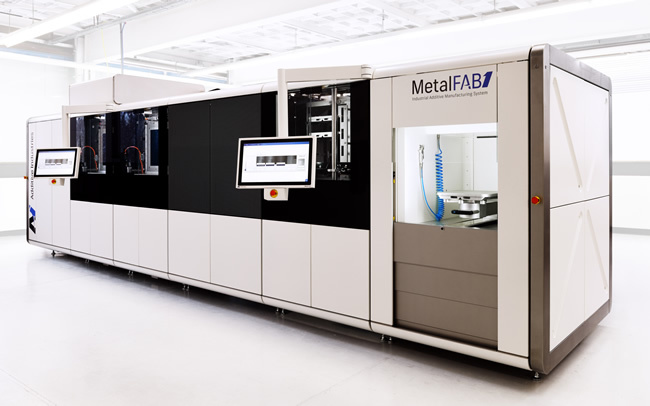 Currently, Additive Industries is testing the MetalFAB1 system in a Beta programme with the first customers in Europe among which is Airbus. In parallel the company is ramping up for series production and plans to deliver the first 0-series systems before the year-end. The industrial grade performance is achieved by robust and thermally optimised equipment design, smart feedback control and calibration strategies, elimination of waiting time and automation of build plate and product handling. The modular design of the MetalFAB1 system allows for customer- and application-specific process configuration. Multiple build chambers with individual integrated powder handling make this industrial 3D printer the first to combine up to four materials simultaneously in one single machine. The MetalFAB1 can be equipped with a maximum of four full field lasers, thereby eliminating the need for stitching when printing large objects. MetalFAB1 is also the only system to include a furnace for integrated stress relief heat treatment. The size of a single build envelope (420x420x400 mm) places the MetalFAB1 among the top 3 largest 3D metal printers available. Exactly 6 months after its successful introduction in Eindhoven, The Netherlands, the company presents its industrial 3D metal printing system and integrated Additive World Platform software to the North American market. ‘We already attracted a lot of interest from US based companies and are proud to announce that we will be ready to accept orders for the first systems in the worlds’ largest metal AM market now’, said Daan Kersten, co-founder and CEO of Additive Industries. ‘The Beta programme is progressing well and the tested system performance gives us the confidence to start-up our operations for companies in demanding markets like aerospace, automotive, medical and high tech equipment in the USA. We are building a regional service organization to directly support our MetalFAB1 users’, added Harry Kleijnen, Manager Process & Application Development. This entry was posted in News and tagged Additive Industries, Airbus, Daan Kersten, Harry Kleijnen, MetalFAB1, RAPID 2016 by AM. Bookmark the permalink.